This week I’m bringing you the last of the summer peach recipes. 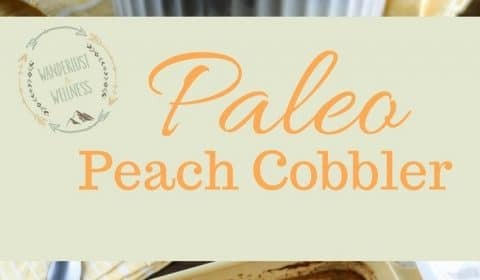 This Paleo peach cobbler is both gluten-free, as well as refined sugar-free. The peaches and raw honey are what brings in the sweetness for this cobbler. 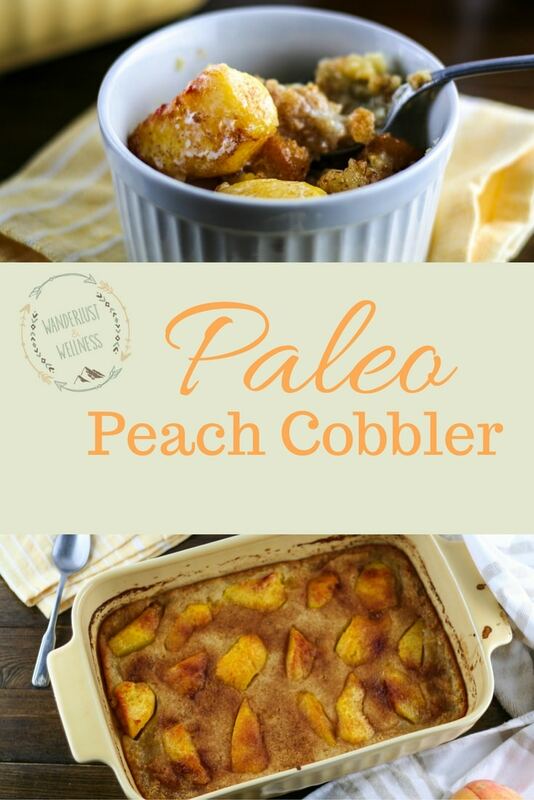 I pretty much love cobbler of any kind, in fact, the more ‘cobbler’ and less fruit the better. But that’s because I love me some crusty carb goodness, which is why I work in gluten-free options so I can still enjoy my favorites without the ingredients that tend to make me feel blah. As I previously mentioned, the raw honey is the key ‘sweet’ ingredient here. With that being said, this cobbler does have a strong honey flavor. So, for my friends who aren’t strong honey fans, this might not be the cobbler for you. That’s my PSA for my non-honey loving friends. Ironically, this cobbler has a bit of a custard like texture even though there is only one egg included in the ingredients. I will also suggest making these either in individual ramekins or in an 8×8 baking dish, no bigger. Otherwise, you’re cobbler will come out fairly thin. Whomp, whomp. In a medium sized saucepan, add peaches and water and bring to a boil. Reduce heat and simmer for about 10 minutes. 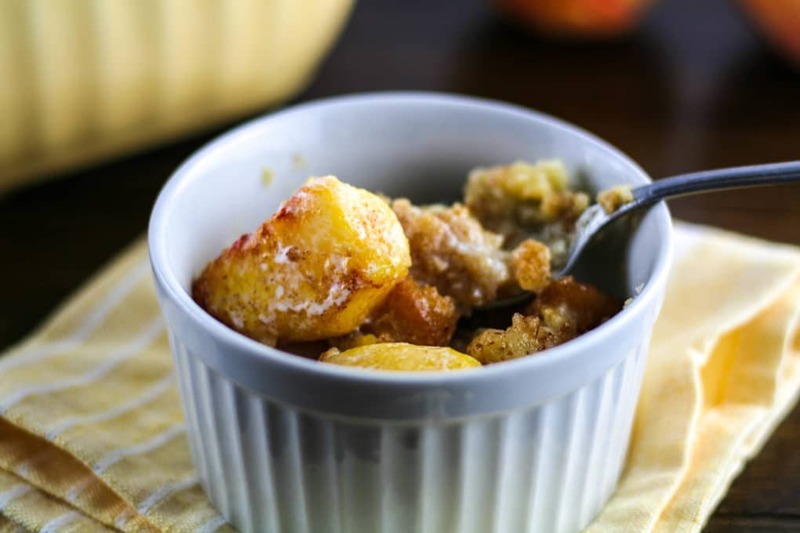 Melt butter and pour into the 8×8 baking dish, or evenly into individual ramekins. In a small bowl, combine gluten-free flour, coconut milk, egg, honey and vanilla. Mix until well combined. 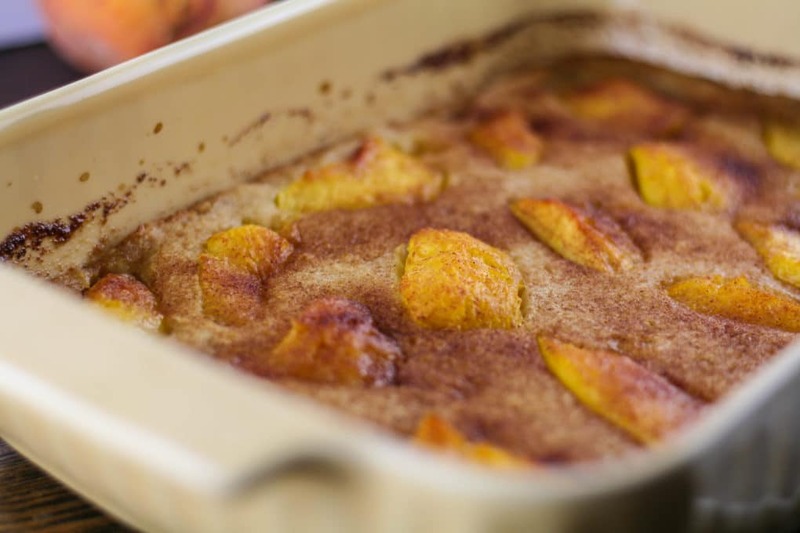 Pour batter into 8×8 baking dish, or evenly into individual ramekins and sprinkle with cinnamon and cane sugar. Bake for 25-30 minutes or until the cobbler begins to brown. Serve with homemade coconut cream or your own topping of choice.